Commercial cast-iron roof drains are often subjected to heavy weathering and regular wear and tear. As a result, their parts—including domes, rings, sump pans, and clamps—sometimes break, crack or rust over time, and need to be replaced. To purchase a replacement part, you need to know the make and model of your original drain. To start, it is best to look for any raised or stamped part numbers that may be visible on the old ring or dome. Unfortunately, if the drain has undergone extreme damage, this can be difficult to determine. 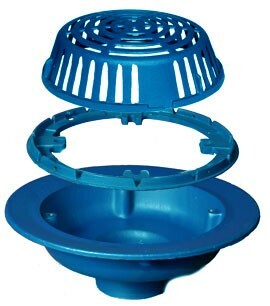 The good news is there are ways to find out this information by looking at the drain’s color and dimensions. Below, we’ve outlined the drain characteristics that will help you identify the make and model of a roof drain, which can then be used to purchase a replacement part. When shopping for an industrial or commercial roof drain or replacement part, it is important to be clear with a manufacturer or distributor what you need. Otherwise, you may inadvertently end up with the wrong drain or part or the wrong size, leading to more time that your roof lacks the proper drainage solution. To help, we’ve complied a list of commonly used roof drain and replacement part terminology, along with descriptions of each and commonly used nicknames. While not a complete list, this should help make sure you are speaking the same language as your sales contact. Bolt-to-Bolt: The distance from one bolt (or lug) to the next, typically in inches. On a 4-bolt drain ring, it is measured using the bolts directly across the ring from each other, whereas on a 3- or 5-bolt ring the distance is measured from one bolt to the next going around the ring.